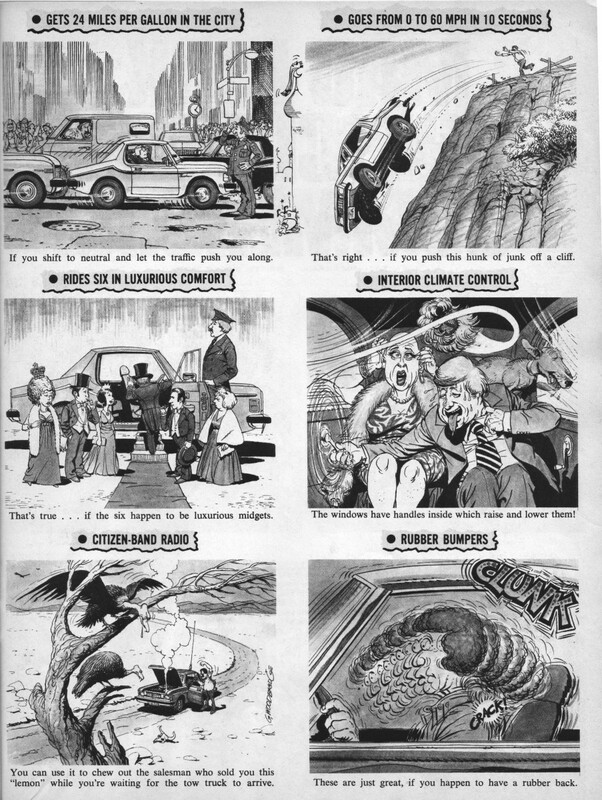 Remember print advertisements? I know, I know; they still crop up from time to time in a … whaddayacallit? …magazine. Anyhow, the ads were filled with all the Plush, Powerful, and Personal goodies that could be yours if you’d just be kind enough to step into the nearest showroom. 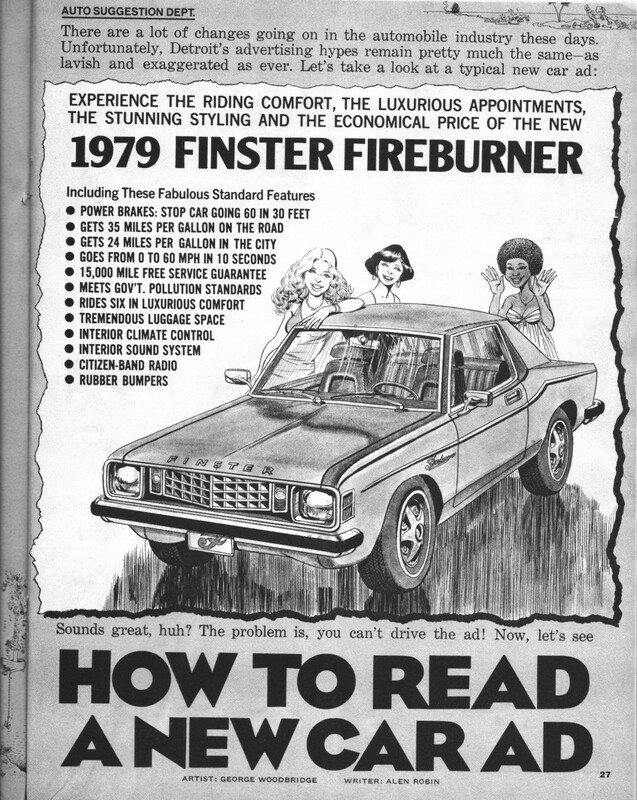 Today’s case in point: The 1979 Finster Fireburner. Oh yes, each important item would be addressed, pointing out the myriad possibilities for your satisfaction. It’s just that, sometimes, things could be left open to interpretation. Thankfully, the folks at MAD pointed out how to read between the lines of these ancient come-ons so we could feel confident behind the wheel of our idyllic new pleasuremobiles. I have to agree with the gents who say that this is more a Ford Fairmont than a Ford Granada. 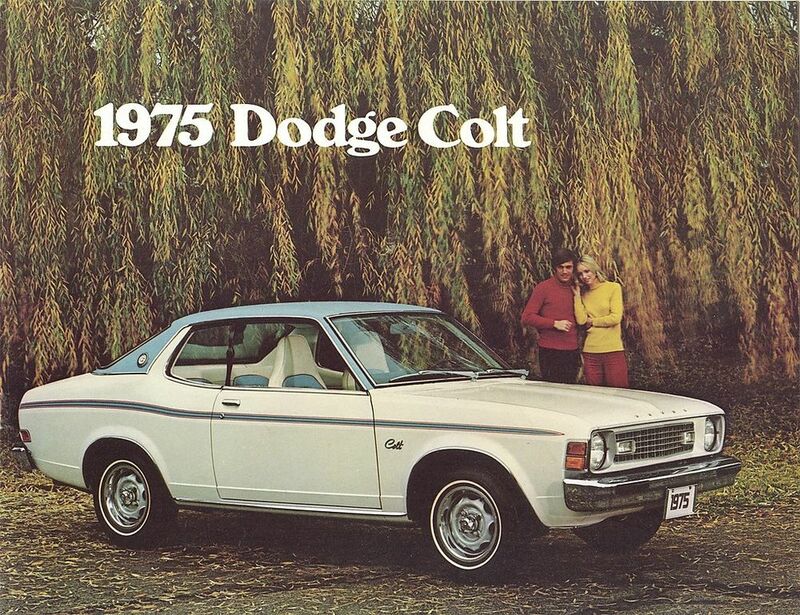 However, being a 1975 Dodge Colt is not as likely. 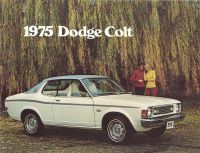 if i am lucky, I can try to attach two pictures here, one of the Fairmont and one of the Colt which, incidentally in this depiction, is an snappy little car. 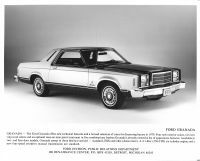 Actually it is a good imitation of the 1979 Ford Granada 2-door hardtop without getting Mad Magazine into a deep lawsuit! You are right. The Granada was the Mercury or an upscale Fairmont. I just do not remember. 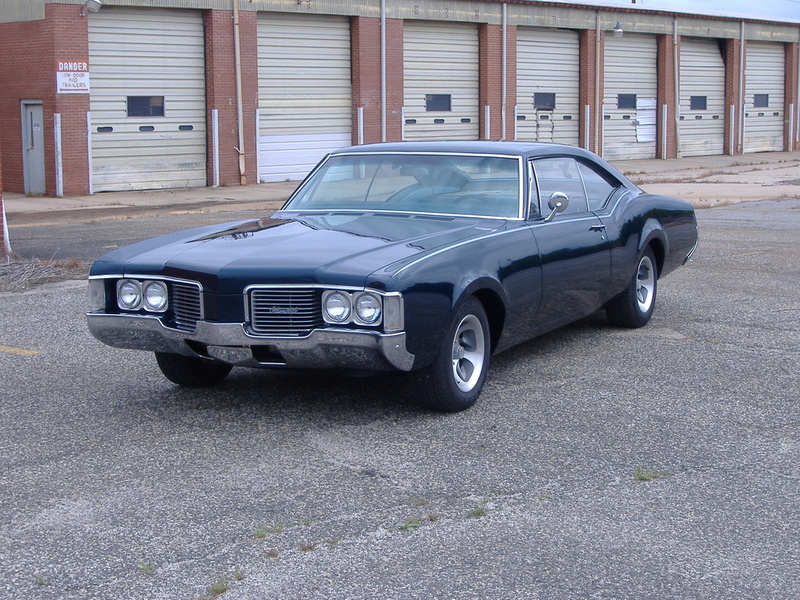 You guys are way off….if that’s not based on a ’68 Olds Delmont 88 I’ll eat my hood ornament. My mom had one exactly the same color she got new. It was a dependable car for her and she only got rid of it when the transmission went out ’88 and it had 135,000 miles on it. 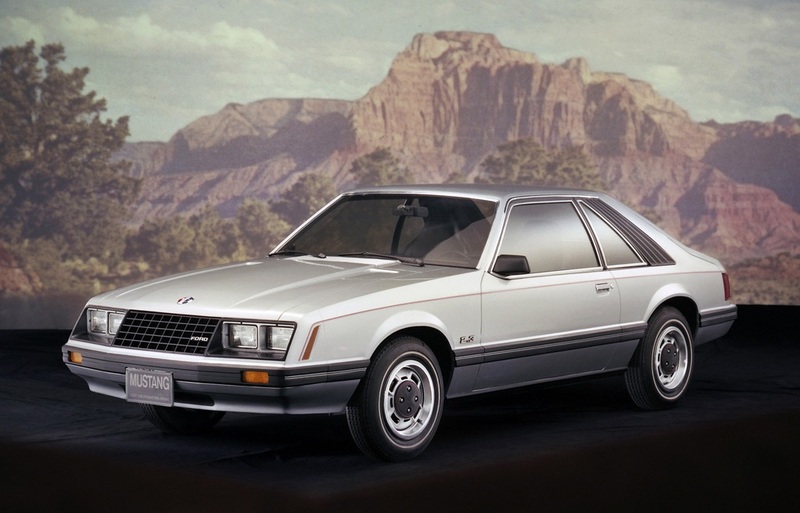 She bought a new ’88 Dodge Lancer which wasn’t quite as dependable and had many problems with it. Typical 70’s-80’s Mopar, if you get a good one your ok but when you get a lousy one your in trouble. 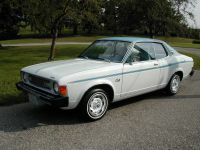 Here is the 1975 Colt. 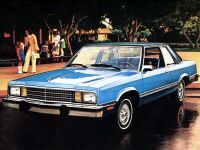 I prefer the soft ride of the 1978 Royal Deluxe II. Ah, MAD magazine. I had stacks of them back in the ’70’s and I read them until they fell apart. Great story, and it reminds me of another picture I saw in MAD. It was an ad for a car called the Phuelhog, and the customer in the showroom was looking at a sticker on the windshield that read “If you could squeeze this car you’d get lemonade!”. A friend of mine still has a bunch of his old Super Specials – I’m just a little jealous. That’s hysterical! I used to read Mad in the 1950’s when I was in high school. It was new on the scene in 1952. I started in high school in 1957. One or two of their editors were alumni of my school. 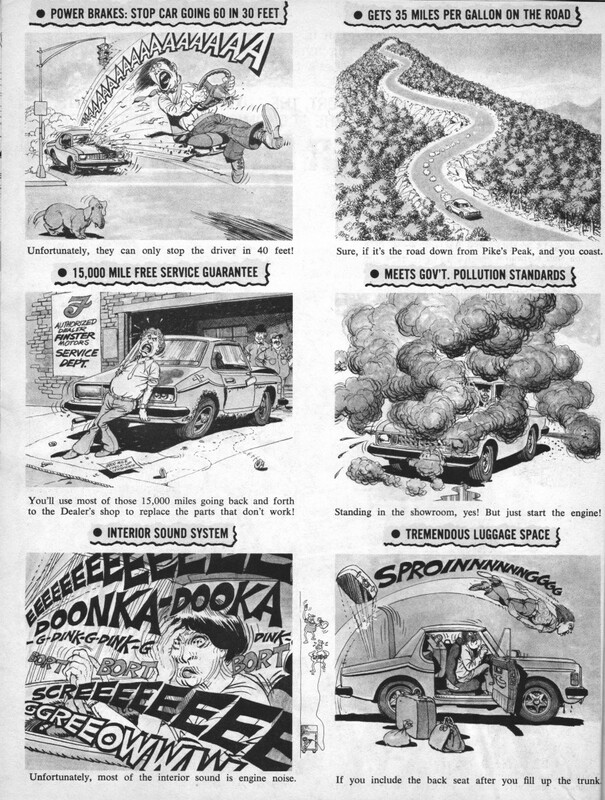 In the ’70’s, National Lampoon ran a parody of ’50’s cars. There was something resembling a massive, chromed ’58 Olds, illustrated (not photo’d) in the style of the day ….. I recall a huge-looking cabin with tiny humans inside. 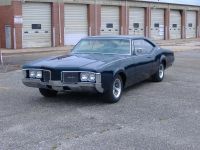 Of course, the driver was a white family man in shirt & tie …… and a fedora …..
1968 Oldsmobile Delmont 88? Uh, I don’t think so. Here is the Oldsmobile to which you refer. Yeah, it was a joke man. Figured I was far enough off that no one would take it seriously. Fairmont front end is what jumped out at me. Every car guy surely remembers that a ’67 Delmont 4-Dr sedan was Ted Kennedy’s ride in the summer of ’69 …..
That’s right! Guess that’s why the name was on my mind. Watched a doc on that lately.